UV Stable Tags withstand harsh outdoor environments. Available in range of sizes, from Â½ in. round to 3 x 6 in. rectangle, UV Stable Black Aluminum Tags are suited for utility pole tags, tree tags, asset tags, well permit tags, equipment inspection tags, and outdoor signage. Products are laser etched, providing high contrast look that makes text, logos, and numbers highly visible, even from distance. Text will not fade and barcodes will stay readable for years. (Newport, KY) – Are you in need of heavy duty tags that will last outdoors for years to come? 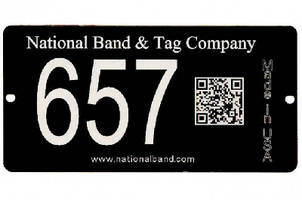 National Band & Tag Company now offers a new tag material, UV Stable Black Aluminum, tried and tested to stand up to the harshest environments. Text won’t fade and barcodes will stay readable for years. These tags have a variety of uses including but not limited to: Utility Pole Tags, Tree Tags, Asset Tags, Well Permit Tags, Walking Trail Tags, Memorial Tags, Equipment Inspection Tags, outdoor signage and more. Tags are custom manufactured in Newport, KY and can range in size from a small, 1/2” round tag all the way up to a large 3 x 6” rectangle tag. Black UV Stable Aluminum tags are laser etched, allowing for a high contrasting look which makes text, logos and numbers highly visible and easy to read, even from a distance.